iPhone crickets wake me at 6am. I call to Cracker Jack. He says, “sounds like snow” and then starts the day singing Take on Me by A-ha. It definitely feels cold enough. I look out through the space between the rain fly and the inner net. Slush is falling from the sky. It’s only slightly warmer, but plenty wet inside my tent. I put on a mixture of clammy clothes and pack everything I can while inside the tent. Only at the last second do I unzip the fly and step out. Cold. Very cold and very wet. I’m not happy and slightly concerned. We hike for 20 minutes and then I stop to pull more snacks from my bag. Plus, I need to pee. Cracker Jack continues on. I begin shivering uncontrollably. Gotta hike. Gotta keep warm. It’s getting difficult to walk though. I have to do this weird kind of concentration to get my legs to move properly. So much shivering. Everything is soaking wet. The trail is a river that is impossible to navigate. My feet are 100% wet. I’m soaked through. I feel sleepy and want to stop and curl up somewhere. Hypothermia. Hike faster. I eat some “toys” and wring out the “waterproof” gloves I bought in White Pass. I keep having to stop and pee. “Hike! Hike!” I urge myself as I watch the slush accumulate around me. Another hour goes by. I look up and see someone in the trees. It’s Cheeseburger, Polar Bear, and Cracker Jack. Cracker Jacks asks me how far I think we’ve hiked. What kind of crazy mile/time warp! Really??!! My mood improves, but I’m still having trouble regulating my body temperature. Polar Bear gives me his puff and Cracker Jack makes coffee. I eat a Snickers. I can feel small warmth rising in my body. Just 9 more miles. I can hardly believe that in three hours and we’ll be in Stehekin! Three hours later, the four of us arrive at High Bridge where the Stehekin bus will pick us up. There’s a lot of talk about where we’re going to stay. There are only two places: the Lodge and the Ranch. Evidently both are full. We board the bus and Ann the driver tells us there is one cabin still available at the Ranch, but it has no electricity or heat. All our gear is drenched and we’re still cold and wet. Do we have any other choice than to take it? We get to the Ranch and learn the available cabin is $100 per person. We look at it. It would be like paying $400 to stay in my tent. There is talk about camping, but our gear is totally drenched. There is talk about just leaving and hiking to Canada, but we need a break. My buddies are not happy. Oddly, I’m still optimistic. The biggest lesson I’ve learned on the trail is not to worry, things work out. Back on the bus. Next stop, the bakery. The Stehekin Bakery is notorious among PCT hikers. We pretty much started talking about it in the desert. So, even though we’re stinky, wet, and possibly have no warm, dry place to stay tonight, we enter this sanctuary of buttery goodness and begin ordering armfuls of cupcakes, kücken, croissants, turnovers, tarts, and pizza. Then Ann hands me a flyer for a cabin. It’s $200 less than the tent and has electricity and more. Additionally, it’s right next to the bakery. No question, we want to stay there. It turns out that the cabin belongs to the owner of the bakery and today is the first day in three months that it’s vacant. Also, it comes with it’s own van! We’re beside ourselves with this turn of fortune. 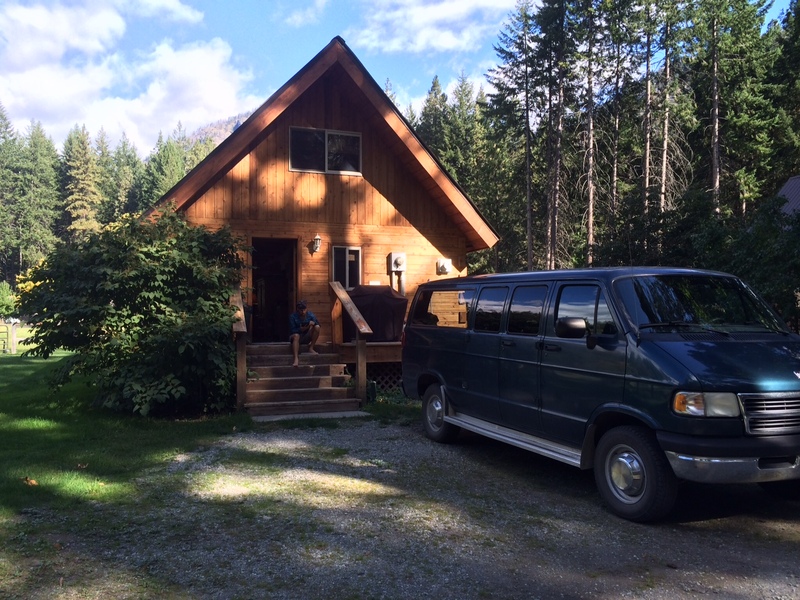 The cabin is amazing – big, clean, and complete with a kitchen, couches, TV and DVDs. We take special steps not to stinkify it with hiker smell. After showers, laundry, and lots of astonishment about our good luck, we curl up on the couches, pop in the Braveheart DVD and make PCT related jokes. One minute, I’m a shivering mess and the next, I’m curled up on a couch watching Braveheart and shouting “Freedom! !” along with Mel Gibson. 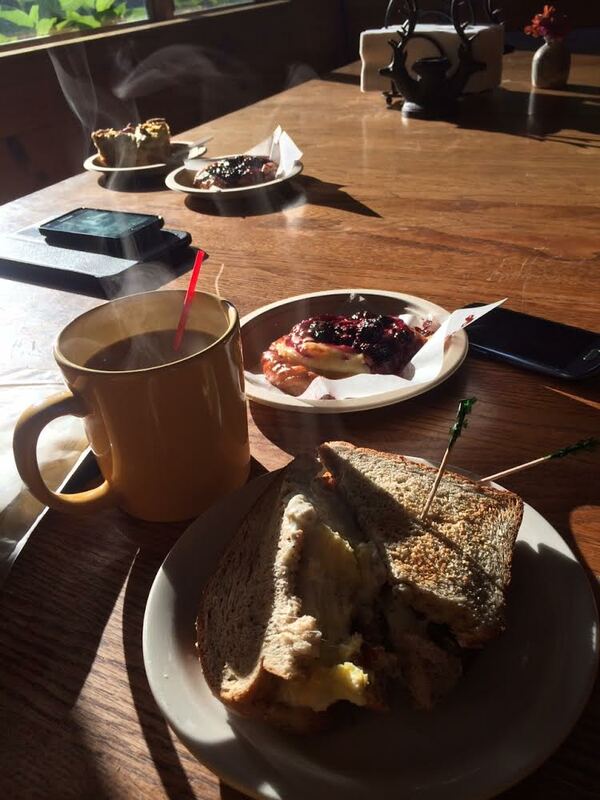 This entry was posted in Transmissions and tagged bakery, braveheart, cheeseburger, cold, cracker jack, elevation, food, high bridge, Hike, hypothermia, mel gibson, PCT, polar bear, slush, snow, stehekin, trail journal, Washington, wet. Bookmark the permalink.